In a recent paper published in Plastic and Reconstructive Surgery, Dallas plastic surgeon and rhinoplasty specialist, Dr. Rod J. Rohrich, emphasized the importance of upper lateral cartilage in rhinoplasty surgery. 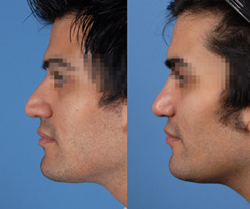 A male patient which received rhinoplasty utilizing principles laid out in Dr. Rohrich's recent paper. This anatomical area, the upper lateral cartilage, is crucial for obtaining optimal outcomes in rhinoplasty. In a new paper published in the latest issue of Plastic and Reconstructive Surgery, Dallas plastic surgeon, Dr. Rod J. Rohrich, and colleagues, examine and underscore the importance of upper lateral cartilage in rhinoplasty surgery. Dr. Rohrich outlines recommendations for rhinoplasty surgeons when addressing this vital area. The upper lateral cartilage in rhinoplasty, refers to a pair of triangular, sail shaped cartilage structures that provide support for approximately the middle third of the nose. Dr. Rohrich points out that this element of rhinoplasty is often treated as being of secondary importance within the existing literature on rhinoplasty, but asserts that the importance of this structure has been historically understated. The paper makes note that, "Even minor alterations to the upper lateral cartilages subsequently affect projection, width, nasal dorsal shape, and tip rotation. Throughout the years, the importance of preserving the upper lateral cartilages has not been fully recognized, emphasized, or completely understood." "This anatomical area, the upper lateral cartilage, is crucial for obtaining optimal outcomes in rhinoplasty," says Dr. Rohrich. "It's a unique area within nasal anatomy that significantly affects both the functional aspects of the nose, and the aesthetics of the final results." "Aesthetically, this area has a tremendous influence on the dorsal lines and should be preserved whenever possible," says Dr. Rohrich. "It also directly affects the nasal tip, allowing for change in rotation, shortening, and refinement."